Last week saw the release of not one but two The Jackbox Party Pack games on Nintendo Switch, letting owners of the system catch up ready for number four later this year. The first still remains a worthwhile venture, as you can read in my review. But, how does the second one fare? 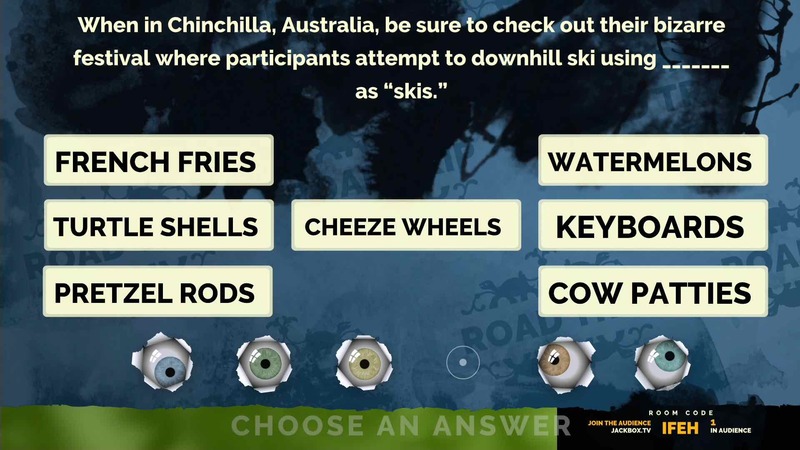 Just like the releases that followed and preceded, The Jackbox Party Pack 2 bundles five party-style games again all played using your smartphone, tablet or computer. This time around though, we’re treated to four brand new ideas and one returning concept, that, unfortunately, make for a much more uneven package overall. Fibbage 2 is one of the strongest inclusions here, but the sequel doesn’t exactly stray very far from its original blueprint. Why change a winning formula after all? Much like the previous game, you’re still trying to fill in the blanks of random facts in the hope of tricking your opponents. As you’d expect, the truths are just as surprising and silly as the last game with the most unlikely of answers sometimes being the correct one. Everything from the structure to the scoring is handled in pretty much the same way as the original, and although it may be a safe inclusion in the pack it certainly remains a particularly fun one. And yes, Cookie Masterson makes a return as host, too. Quiplash is the first of the new bunch and easily ranks among the best that Jackbox Games has produced. Whereas the likes of Fibbage and Drawful rely on your ability to produce convincing answers, here you’ll need to simply tap into your funny side. Rounds begin with each player receiving two random prompts to their device to then respond to -“A terrible name for a cruise ship,” for example. Your answers can then be just as simple, complex or insane as you wish. They can even be as offensive as you want. After every submission has been received your responses will go head to head with another player where the group will then vote on their favourite. As you can imagine, the real goal here is in knowing your audience. I found playing with my family, the answers I gave that steered away from crude won far more votes whereas playing with my mates meant a change in strategy. The more ridiculous the better. Quiplash has offered some of the biggest laughs of any game that I have ever played and is only limited by the imagination (or twisted sense of humour) of the group that you are playing with. Now, I’d argue that these two games are reason enough to pick up this package alone… if it weren’t for the fact that they have seen improved sequels in future editions. 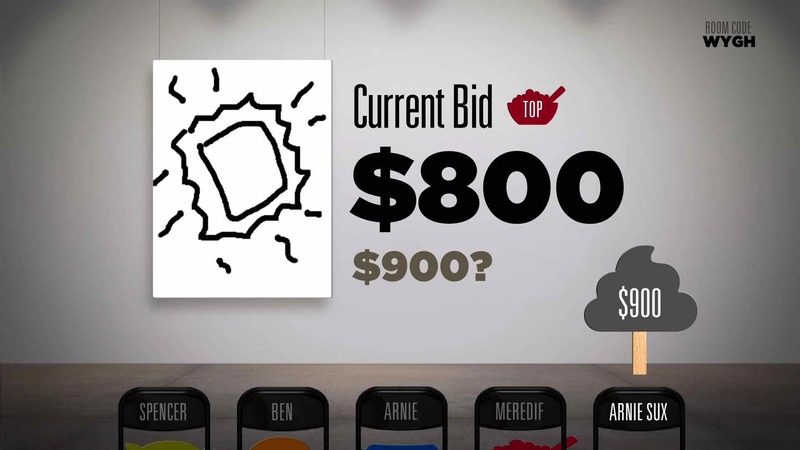 In The Jackbox Party Pack 3, Quiplash 2 adds user-created prompts, therefore, extending its lifespan to practically infinite, while later this year Fibbage 3 will include facts about your group of players – a cool twist on the formula. The third game, Earwax, is one of the weaker attempts. Players one by one each take on the role of a judge who chooses the winner for a single round. After the judge chooses a prompt, players then select two random sounds that they think link well with it – anything from a golf ball landing in water to a gasp or laugh. Not to say that there is zero fun to be had here, but the restriction of picking from a small handful of sounds definitely hinders how creative you can be. Unlike Fibbage or Quiplash, the laughs were lesser and shorter for sure. 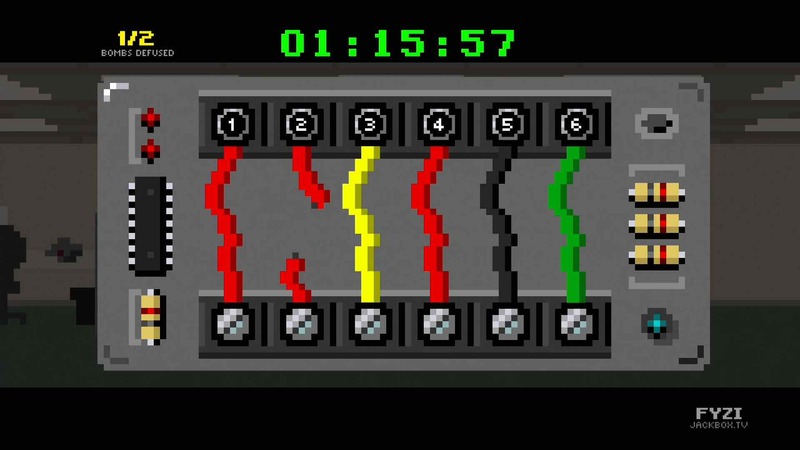 And then there’s Bomb Corp., an interesting idea that focuses on the teamwork between up to four people rather than competitive play – the aim being to correctly defuse bombs, or later organise exploding file cabinets and so on. Each member of your squad receives a page of information key to defusing a bomb, things like “cut every red wire” or “do not cut the third wire.” It seems simple enough. However, as you progress things get tougher with pages often contradicting other pages. While mine might tell me to cut all red wires, a friend’s might warn against snipping the third wire that also happens to be red. As you can imagine, communication is key and, as you may also predict, this can often spiral into shouting and yelling. Bomb Corp. is a neat idea, but one that can frustrate especially as the difficulty ramps up with one false move meaning going back to the beginning for your team. The last new addition is Bidiots, a drawing and auction hybrid that proves more trouble than its payoff is worth. Everyone first draws two “works of art” before being given an allowance to spend on actually bidding later in the game. Every player is also given different clues as to which artworks are more valuable and worth going for. The more your work sells for the better and, likewise, if you underpay for an expensive piece. The winner is the person to accumulate the most cash by the time all paintings have been sold. There is a slim amount of strategy to be found here, but unfortunately, it happens to be buried upon layers of confusion and convolution. While I’d happily recommend can read in my review that also released on Nintendo Switch this past week, its sequel is a tougher sell in that it has five uneven offerings. The clear standouts here are Quiplash and Fibbage 2, both of which still hold a ton of enjoyment. However, they have also seen improved and expanded sequels that have been released since. Bottom line, now that all three compilations are on the Nintendo Switch, you are better off going for the first or third to see the best that the series has to offer.